OK. As I mentioned in the last blog post, a new book has come into the collection. It was only released in November. I don’t know if you’ve seen these types of books before but they are like a box set in that the book itself sits inside a hard outer casing. The hardback book slides out and, as well as the usual text and photographs, on certain pages inside are pouches that contain replicas of memorabilia associated with the topic. I’ve got one of these already about Bob Dylan. 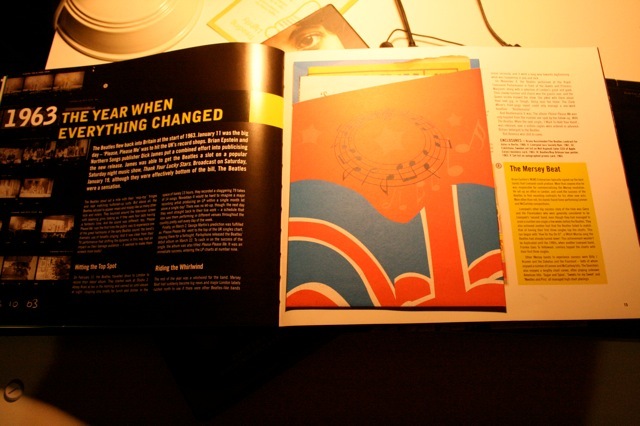 Its called “The Bob Dylan Scrapbook”. I saw another of these books in a store the other day – it was a history book all about the Vietnam war. 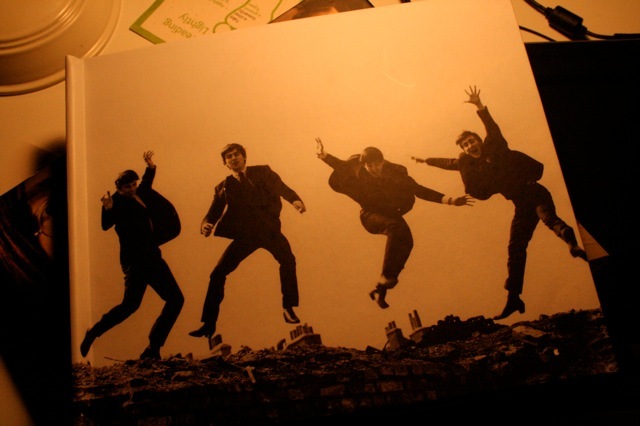 Anyway, this new release is all about The Beatles. 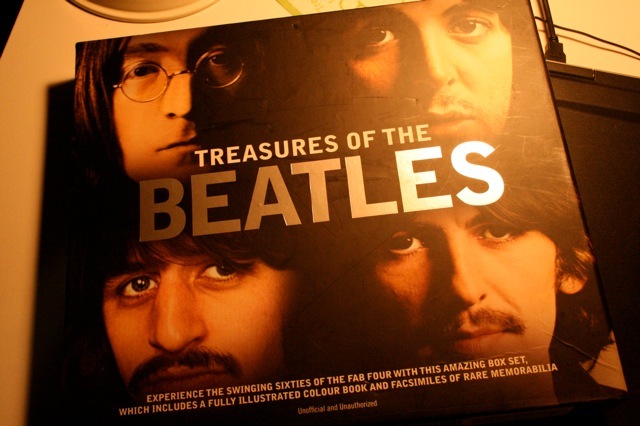 Its called “Treasures of the Beatles” and it follows the history of the band from the early days in Liverpool and Hamburg, up through each album, the creation of Apple Records, and on to the perhaps inevitable break-up and briefly the solo careers beyond. It is written by Terry Burrows. 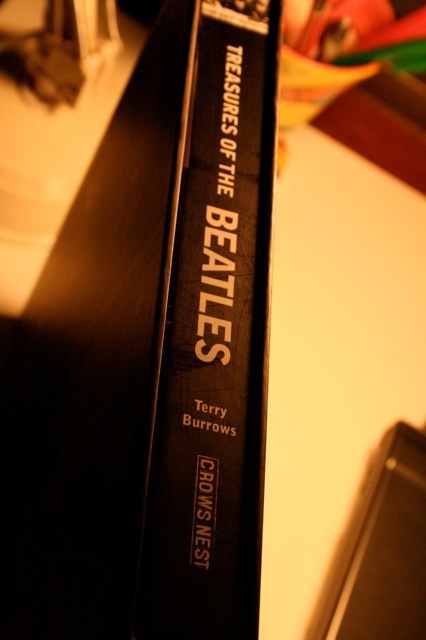 He’s a fairly prolific music author and you can see some of his long list of other things he’s written here, including some other Beatles-related titles. Terry has written a loving tribute to the band and there are lots of great photos inside – some of which I’ve never seen before. 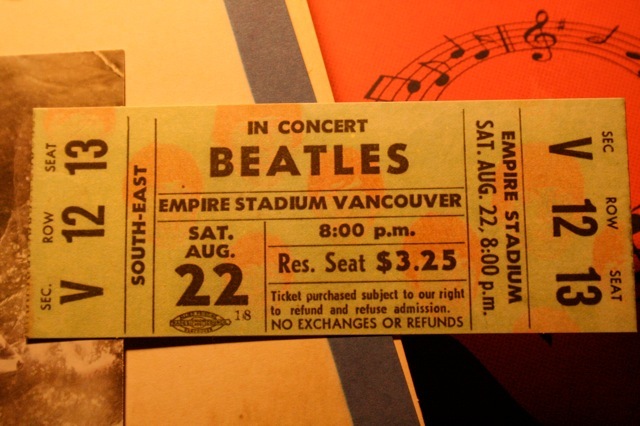 But the great part about discovering this book is opening up the little pouches which are full of surprises like publicity and concert posters, replica concert tickets, contracts, hand-written set lists, tour itineraries, postcards, and even a 1967 invitation to The Magical Mystery Tour. What does it all look like as you browse through the book? Below are some photos, an “unboxing” of the book with a few pages on display and some of the facsimiles of rare memorabilia that are contained within. Enjoy. 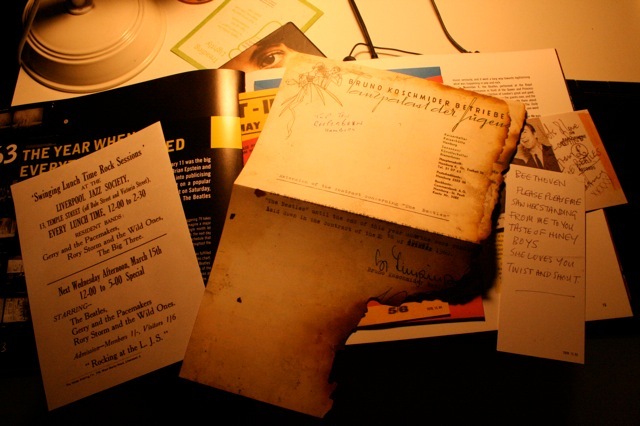 Treasures example - including (burned) replica contract document, etc. 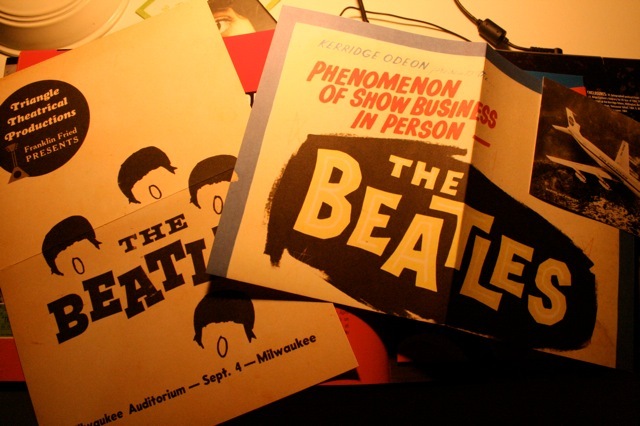 This entry was posted in Beatles, Beatles Collecting, Beatles Music, Beatles Related, George Harrison, John Lennon, Paul McCartney, Ringo Starr and tagged Beatles, Beatles Collecting, Beatles Related, Bob Dylan, books, George Harrison, John Lennon, Music, Paul McCartney, Ringo Starr, Unboxing by beatlesblogger. Bookmark the permalink. I’m from Colombia, and in my last birthday my parents give me the book. they bought it in internet but i think is incomplete, could you tell me the full list of memorabilia and the number of pouches?, i saw you photos and i don’t have somo stuff. It is always a risk purchasing over the web as you don’t know if you are getting all the inclusions in the original release. 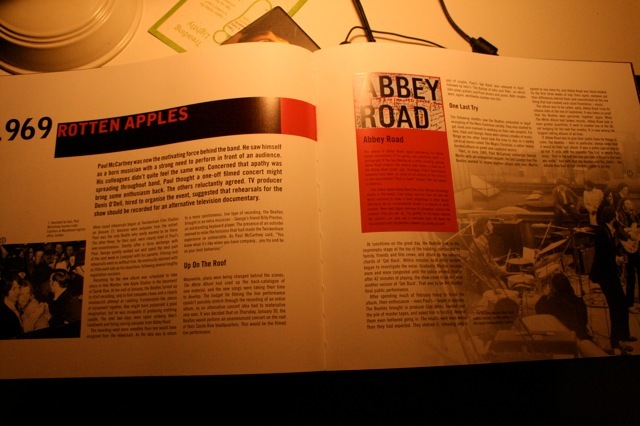 I bought a similar book on the internet about John Lennon called “Lennon Revealed” that also has lots of replicas of items from John Lennon’s life (see: https://beatlesblogger.com/2011/07/08/lennon-legend-book/) and it had a couple of items missing too, so I know how you feel. OK, the copy of “The Treasures of the Beatles” I have has five pouches in all. These I have just noticed are simply stuck into the book with adhesive tape (which I think is a bit basic as these could easily be removed). In Pouch 1 (inside the front cover) there is a colour poster of a photo taken of the band performing on the Ken Dodd Show on British TV. In Pouch 3 (on page 23) there is an autographed airline postcard; a hand-written itinerary for the US tour on a brown piece of cardboard; a poster for a performance at the Kerridge Odeon Theatre in New Zealand (you can see this in photo 7 on my blog); a small green ticket from the show at the Empire Stadium in Vancouver (see photo 8 in my blog); and a black and white handbill for the show at the Milwaukee Auditorium (also seen in photo 7 on my blog). In Pouch 4 (on page 39) there is a signed postcard from the Hotel Edelwelb where “Help!” was filmed; a Cathy Pacific signed card with Beatles photo on the front; a small, coloured flyer from the Japan tour; a blue ticket from the Rizal Memorial Football Stadium concert in Manila; the cover of a program from the Rizal Memorial Stadium concert; and a Magical Mystery Tour party invitation (pink and purple colour). 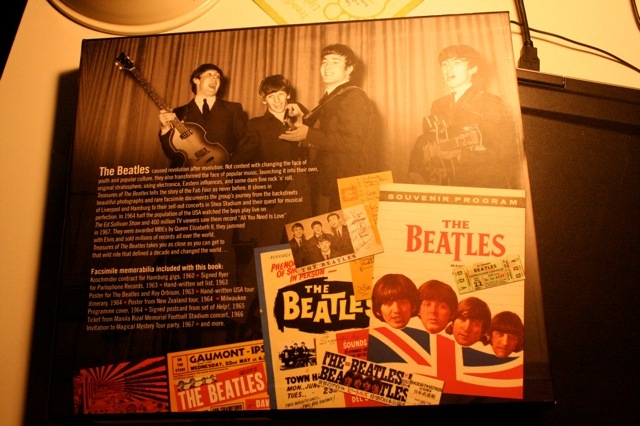 In Pouch 5 (inside the rear cover) there is a black and white poster of the band taken at the launch of Sgt Pepper. Hope this helps. I’ve also just noticed that each page with a pouch (inside front cover, pg15, pg23, pg39, and inside rear cover) has a list of what should be in the pouch on that page. Its got the heading “Enclosures“. Good luck.